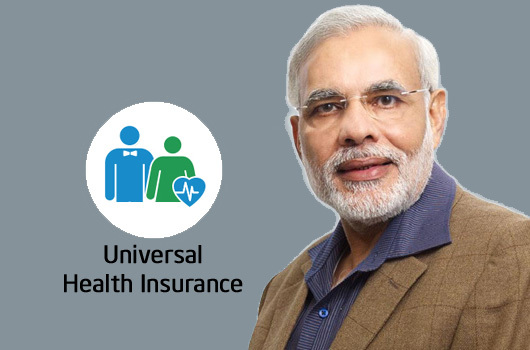 PM Narendra Modi is likely to announce Universal Health Insurance scheme for the common man soon.Prime objective behind Universal Health insurance policy is to provide health cover to every individual of India. What is Universal Health Insurance Scheme? Universal Health Insurance scheme is a family floater health insurance policy by the government of India. This scheme will offer coverage up to 50,000 Rs to a family of five people on floater basis. This scheme will also cover senior citizen. The entire family will be covered under a single sum insured as per draft. As per latest information, this policy will be sold by private insurance players like ICICI Lombard, Bajaj Allianz, Iffco Tokio and HDFC Agro as well as LIC. PM Narendra Modi is likely to announce this plan soon. Last year PM Narendra Modi had announced financial inclusion program Jan Dhan Yojana that got very good response. At a later stage, he announced social security schemes like Atal Pension Yojana, Pradhan Mantri Suraksha Bima Yojana, and Pradhan Mantri Jeevan Jyoti Bima Yojana. Universal Health Insurance plan is likely to replace Rashtriya Swasthya Bima. This new Universal Health Insurance scheme will be a boon for the common man who is seeking preliminary health care services in India. This scheme will also help the senior citizen of India. Currently, senior citizen has to pay a huge premium to get health coverage, with the launch of Universal Health Policy they will be able to purchase health plan at much lower rate. As per me, PM Narendra Modi is perhaps the best candidate for prime minister. He is people prime minister, who think about people and take appropriate actions. His government might have failed in controlling inflation (bringing acche din), but he is touching people life by creating social security program and schemes like Sukanya Samriddhi Yojana. You might be surprised to note that Modi government has launched 21 Schemes for Indian’s in past one year. What is your reaction about hearing Universal Health Insurance scheme by government? So far, no news anouncement for govt. about this. any updates regarding this?